Scientists in South Korea have developed a new type of covert hologram - known as self-assembled photonic crystals (SAPCs) - that can be produced on inkjet printers. The SAPCs are invisible against a white background in daylight - making them covert - but are revealed under strong light such as a smartphone flashlight or against a dark background, say the researchers from the Ulsan National Institute of Science and Technology (UNIST) and Korea Institute of Machinery and Materials. This overt-covert transformation means the SAPCs show "remarkable potential for anti-counterfeit techniques", according to the team, which notes they can be designed to display different colours depending on the angle of viewing. Using 2D nanogratings, they were able to achieve optical encryption and decryption using colourful images incorporating red, green and blue (RGB) histograms that can be read using a regular smartphone. As they can be made using commercially-available inkjet printers the SAPCs should be cheaper to produce than those made using other nanofabrication techniques such as photo-lithography, two-photon patterning, and direct-writing assembly. 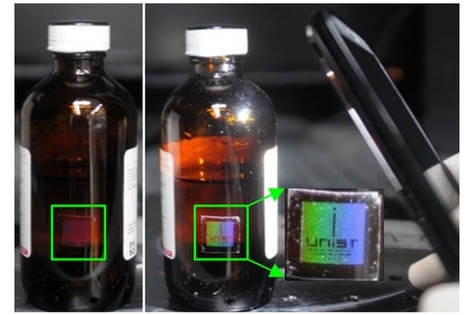 "The structural colorations designed by inkjet printers would not only produce optical holograms for the simple authentication of many items and products but also enable a high-secure anti-counterfeit technique, they write in Nature Scientific Reports. Pharma anti-counterfeit market set to rise "substantially"